If machines that can hunt you down aren't scary enough, what about taking animals and wiring them in a way to do the same feat? You wouldn't even need a remote control system -- you just hook it up to the same self-modeling system being used in robotic locomotion, and you've got animal zombies. And why stop there? Why not put this technology to use to create REAL zombies? 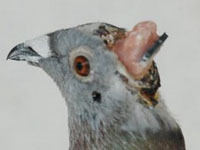 Scientists with the Robot Engineering Technology Research Center of east China's Shandong University of Science and Technology say they implanted micro electrodes in the brain of a pigeon so they can command it to fly right or left or up or down. 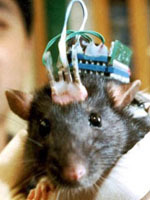 Each rat has electrodes implanted in three areas of the brain: the olfactory cortex, where the brain processes odour signals; the motor cortex, where the brain plans its next move; and the reward centre, which when stimulated gives the rat a pleasurable sensation. The electrodes, each consisting of an array of up to 32 stainless steel wires 75 micrometres in diameter, are permanently implanted in the brain and can give accurate signals for up to nine months. 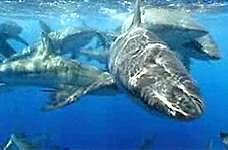 Atema proposed that because sharks are expert at tracking odors over very long distances, the key to steering a shark was to follow its nose. With more than a year of DARPA funding, which ended last year, Atema was able to use electrical stimulation of a shark's brain, mimicking odor, to guide the shark around a large tank.